The South Yorkshire village of Ecclesfield has used the scanning bureau service provided by Kendata Peripherals to enable it to complete its Village Plan within the deadline set by local funding bodies. In common with thousands of other villages across the country, Ecclesfield was faced with thetask of surveying its 2000 households and preparing an action plan for the future development of the village. Although funding had been made available to achieve this aim, it was conditional on completing the plan within relatively tight timescales. According to Jim Percival of the voluntary organisation Ecclesfield Village Plan, the most time-consuming part of the process would be entering the data from the completed questionnaires: "We had heard that a neighbouring village had taken 3 years to finish their study, but our finance would run out in 3 months, so we had to find a quick way of getting all the data into the computer." After researching various scanning services on the internet, Percival made contact with Kendata and was immediately impressed with the response. "They took our version of the questionnaire booklet and improved it in several vital respects, ensuring that it was not only optimised for scanning but also easy to fill in," he said. The revised questionnaire was then printed and distributed throughout the village, and around 800 completed booklets were returned. These were forwarded to Kendata, where they were scanned and processed using automated systems and the company's own in-house developed forms-processing software. This software provides a complete audit trail by printing a unique identification number on each sheet as it is scanned, which is especially important when dealing with longer survey booklets as they have to be separated into individual sheets prior to scanning. In addition, the software randomly selects a certain number of forms from each batch for QA validation in accordance with the sampling requirements of ISO2859/BS6001, thereby confirming the integrity of the data. 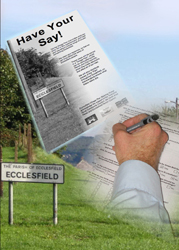 Once all the Ecclesfield questionnaires had been scanned and processed, an Excel spreadsheet of the results was e-mailed back to Jim Percival, enabling him to carry out the necessary analysis and complete the village plan before the deadline. "Quite simply, Kendata came to our rescue - we could not have done it in time without their help," he said.